A new article on hair transplantation, published by Dr. Ray Woods, inventor and world pioneer of FUE (Follicular Unit Extraction) and BHT (Body Hair Transplant). For clinicians engaged in hair transplant it is vital that there is clear communication with patients about realistic cosmetic outcomes . Patient satisfaction is heavily reliant on meeting expectations; therefore clinicians should endeavour to ensure that both they and their patients are sharing a common understanding. The Baldness to Donor Ratio Method (BDR Method) is a tool to assist clinicians to communicate with patients about their possible cosmetic outcomes of hair transplantation. With the rise of the internet consultation  and cosmetic tourism, potential patients want remote assessments to make their decisions and often invest considerable resources upfront for cosmetic services based on information given `sight unseen,. With regard to hair transplant, many clinicians rely on patient photographs and the Norwood Scale  that describes patterns of hair loss to make assessments. From research  and empirical observation it is evident that heads vary widely in shape and volume; therefore patterns of hair loss alone do not provide a satisfactory yardstick for clinicians to make accurate remote assessments. 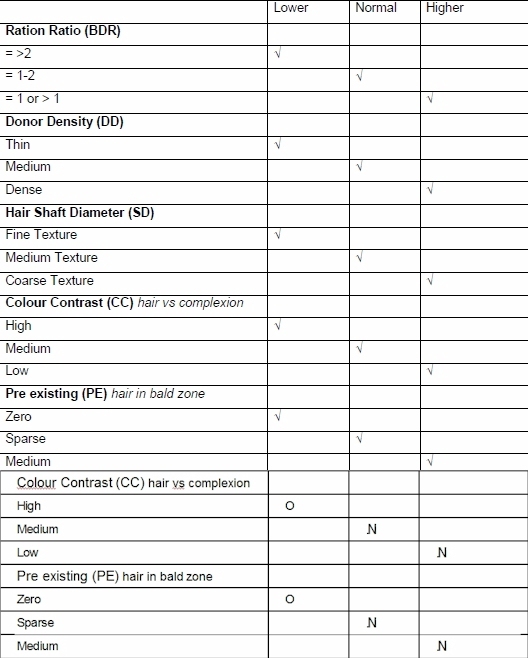 In addition to the size of the bald area and limitations of available donor hair, other characteristics to be usefully considered in patient assessment for hair transplantation are the: contrast of hair colour compared to skin complexion; density of the donor site; pre-existing hair on the balding area and the diameter of the hair shaft. These characteristics taken together convey a clearer picture to inform a clinical opinion about achievable cosmetic outcomes and costs. The internet is an influential communications tool and with the advent of blogs and chat forums it is also a powerful form of information and misinformation and a public record of patient satisfaction . Clear descriptors will facilitate appropriate comparisons and discussion both between patients and clinician to patient. With the uptake of Follicular Unit Extraction techniques  the additional information about the patient characteristics allows a more accurate assessment as to the numbers of grafts, costs and expected cosmetic outcomes. The BDR Method has evolved over time in response to increasing demand for remote consultations and the observation that accurate assessments are not a simplistic function of baldness and donor areas. *Increased patient satisfaction with hair transplant as patients will have realistic expectations as to their cosmetic outcomes. The BDR Method is a simple two part process incorporating patient characteristics that in addition to baldness should be considered in assessing a patient for hair transplantation. Patients complete a semi -quantitative self assessment to give a ratio of their 'bald to donor, areas plus a qualitative self assessment. The process described below. 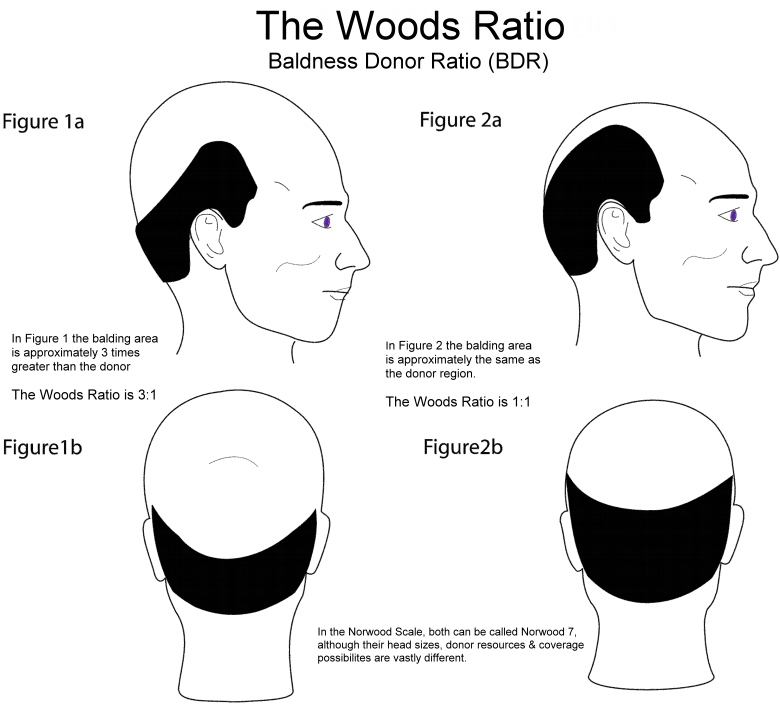 Ratio of bald area to donor area: A useful measurement technique is to take a thin cloth, or paper and trace around the bald and donor areas; A visual approximation will suffice to assign a ratio. For example a ratio of 1:1 = Ration = 1 indicates the patient has 50% of the scalp covered with hair and 50 % balding. 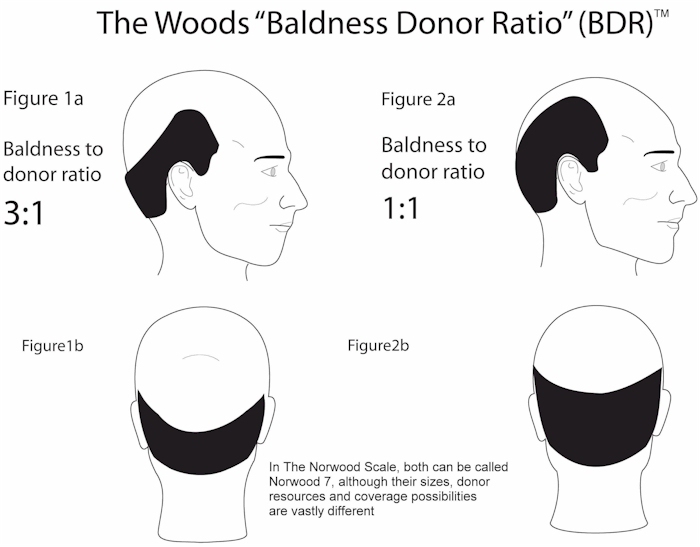 2:1 = Ratio = 2 indicates the bald area is twice a big as the donor area. Therefore the higher the Ratio the less donor head hair. This method is simple, robust and accounts well for variations in skull volume and shape. Part 2. A qualitative assessment. The patient selects their skin and hair characteristics from the options below. *Donor density (DD): Thin, Medium, Thick — The thicker the donor hair the more available for grafts. Table 1 Summary of the BDR Method: Characteristics and their effect on hair transplant coverage. Ratio =1 / DD Dense / SD Coarse / CC Low / PE Medium. In this example the patient has very favourable characteristics that would support expectations for a good cosmetic result. To note, additional donor hair may be available from chest hair if the patient is suitable . Patient demand for internet consultations challenges clinicians to accurately assess and manage outcome expectations for hair transplantation. In addition to the bald area and limitations of the donor site: Patient characteristics such as contrast between the hair colour and skin complexion; the density of the donor site; the pre-existing hair on the balding area and the diameter of the hair shaft are important factors. Patient self assessment using the Baldness to Donor Ratio (BDR) Method can provide semi-quantitative and qualitative data to assist clinicians in remote assessments. The BDR Method is a tool: To increase the accuracy of clinicians making remote assessments; to provide clinicians with a systematic approach to documenting the patient record; increase transparency as to how assessments and costs are derived and assist patients to evaluate second opinions. In addition to the above, given the extraordinary use of consumer internet forums in the field of hair transplant, the BDR Method can facilitate discussion with agreed descriptors thereby supporting patients in forming realistic expectations. Given the link between expectations and cosmetic outcomes, it is anticipated that patients holding realistic expectations will have higher levels of satisfaction. 1 Rohrich, R J. Mirror, mirror on the wall: when the postoperative reflection does not meet patients’ expectations. Plastic & Reconstructive Surgery. 108(2):507-9, 2001 Aug. The videos and photos you see on HairSite are provided by our paid sponsors and are not endorsed by HairSite in any way. HairSite does not warrant the information provided in any of the videos or photos featured on this site. The recommendations, results, and representations made by our sponsors do not reflect the opinions, experiences, findings, or experiences of HairSite. Interesting concept, will this still work for someone who is a norwood 0 approaching norwood 1? Will the ratio still be meaningful? I find the zone 1, zone 2, zone 3 classification the easiest to understand. All I need to know is how many grafts I need in each zone. This new classification and even the norwood scale not easy to follow precisely. » I find the zone 1, zone 2, zone 3 classification the easiest to understand. » classification and even the norwood scale not easy to follow precisely. What does zone 1,2,3 mean? » » classification and even the norwood scale not easy to follow precisely. » What does zone 1,2,3 mean? » » What does zone 1,2,3 mean? Both Armani’s chart and Dr. Woods’ BDR ratio fail to address diffuse thinning, I notice a lot of guys actually have diffuse thinning. » » » What does zone 1,2,3 mean? » thinning, I notice a lot of guys actually have diffuse thinning. I think you are mixing apples with oranges, Dr. Woods concept is a ratio for hair transplant planning, it measures donor vs baldness, the higher the ratio the more likely the patient can benefit from a hair transplant, Armani’s chart and the norwood scale are just hair loss classification telling you how bald a person is. » telling you how bald a person is. Shouldn’t it be the other way around? the lower the ratio the more likely the patient can benefit from the surgery? New diagram to better illustrate this new concept in hair transplantation. Provivded by courtesy of Dr. Ray Woods’ clinic. The hair transplant industry has relied on Norwood’s male pattern baldness classification chart for decades. His classification neglected integrating disparities existing among different ethnic groups displaying various patterns of hair loss. “Alvi Armani Hair Loss Scale” a new classification system developed by Dr. Antonio Armani. Representation of genetic pattern baldness globally from various ethnic backgrounds and diverse groups are included in the new system. The “Scale” replaces Dr. Norwood’s older scale. His scale indicated one balding pattern. 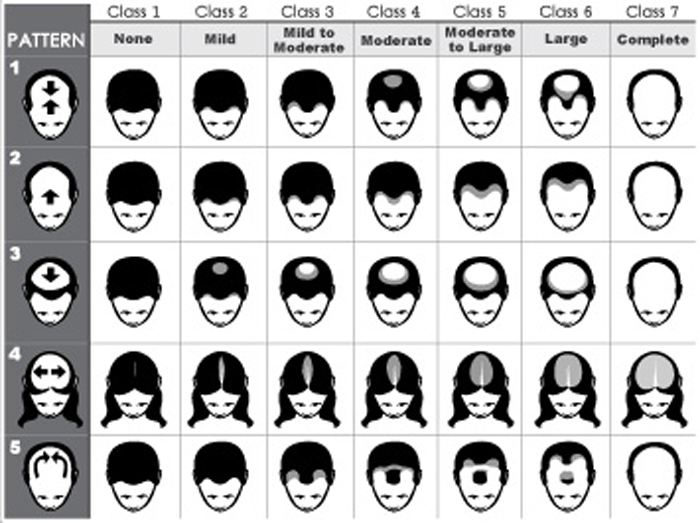 Dr. Armani’s 5 different patterns of balding accurately depict global diversity in receding patterns. Pattern 1: Describes Norwood’s older classification states hair loss from the front and back eventually meets in the middle. Pattern 2: Hair recedes from the crown progressing to front hairline. Pattern 3: Frontal hair loss progresses towards the crown. Pattern 4: (Ludwig’s Pattern) Centrally based balding progresses outwards. Common with women, the pattern also targets a vast majority of men in the Mediterranean and Middle Eastern regions. Pattern 5: A crescent shape progresses around a small tuft of hair, commonly found in men of Mediterranean, Middle Eastern, and Asian regions. Good illustration but still it doesn’t address diffuse thinning. » New diagram to better illustrate this new concept in hair transplantation. » Provivded by courtesy of Dr. Ray Woods’ clinic. I think I am correct, the smaller the 1st number in relation to the 2nd number, the more likely the patient can benefit hair transplant, someone who is a Norwood 1 will probably have a ratio like 1:7, can someone confirm that? Either I don’t understand how this works or something is not right about the chart. Figure 2a and 2b are typical norwood 6s and no way can the ratio be 1:1 for a norwood 6. » be 1:1 for a norwood 6. The problem I see is that even if it is a 1 to 1 ratio, it doesn’t really mean all that much, it’s not like 1 to 1 meaning you have exactly enough donor to match the bald spots. eg: Bisanga’s approach is to not take out more than 30% of the donor so 1 to 1 ratio from Bisanga’s perspective is actually 1 to 0.3 meaning the patient only has 0.3 graft for every 1 baldness unit. That is true but remember that the recipient is being transplanted at a lower density so IF it were at 1/3 of the donor then 1:1 would work. All in all I agree though 1:1 would not give full coverage even at a significanty reduced density. Agreed. Maybe even density #s?